MyCareboard is an integrated patient care self-service solution for healthcare providers, designed to enhance the patient experience and improve engagement. The digital whiteboard aims to aid communication between patients, families, and medical professionals at the point of care through visual and interactive CareQs. The modular CareQs each have a different function and range from prescribed education to eConcierge services. MyCareboard works as an interactive dashboard for both patients and care staff which can be utilized on a mounted television display, touch screen bedside monitor, or mobile tablet. Users can create a personalized experience by choosing from a range of widgets, or CareQs, to create a custom dashboard. CareQs are designed to help improve patient care by tailoring it to the patients needs, and to provide healthcare providers with the information they need to care for each patient. Healthcare professionals can configure their MyCareboard to display information on a patient's dietary requirements, care plan, family contacts, visitation hours, vital signs, goals, and more, in order to provide tailored care. 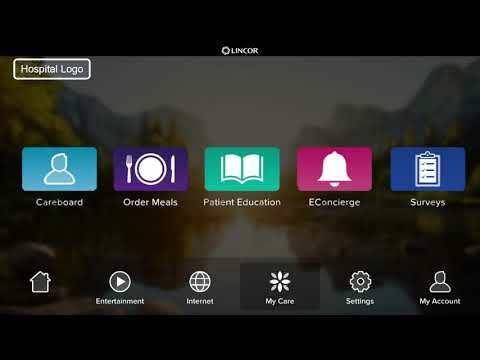 For patients, MyCareboard can be used to access entertainment, complete prescribed education courses, contact their care team, order meals, and manage other eConcierge services such as housekeeping and prescriptions. MyCareboard displays relevant care information about treatment plans, care teams, hospital information, and more, from the patient’s bedside. With 23 different CareQs to choose from, users can customize the experience and implement modules that work within their business workflow. There are currently no reviews of MyCareboard. Contact Lincor for pricing information. Aid care teams with providing tailored care through the Nurse’s Dashboard which provides up-to-date information on patient dietary restrictions, care plans, isolation status, transitions, fall risk, goals, and more. The dashboard can be customized to show the most important information. Improve the patient experience with self-service access to entertainment, eLearning courses, bedside meal ordering, communication with care staff, and more. Patients are always kept in the loop about their recovery and care. Customize CareQs to provide the information most important to the facility and type of patient care. Choose from; prescribed education, eConcierge, surveys, rounding, meal ordering, premium entertainment, family contacts, vital signs, goals, pain management, and much more. Utilize the MyCareboard on a mounted television display, touch screen bedside monitor, or mobile tablet, so that patients can access services without leaving their bed, and staff have information on hand at all times. Bridge the communication gap between patients, family members, nursing staff, and doctors with features such as messaging between family and physicians, visitation information for families, and real-time health record updates for staff. Below are some frequently asked questions for MyCareboard. Q. What type of pricing plans does MyCareboard offer? Q. Who are the typical users of MyCareboard? Q. What languages does MyCareboard support? Q. Does MyCareboard support mobile devices? Q. Does MyCareboard offer an API? No, MyCareboard does not have an API available. Q. What other apps does MyCareboard integrate with? Q. What level of support does MyCareboard offer?